For years we have been servicing our Mazda Protege with Guelph City Mazda - the service team there is fantastic. They are very professional and have the best interest in myself and my family when recommending immediate and upcoming repairs. 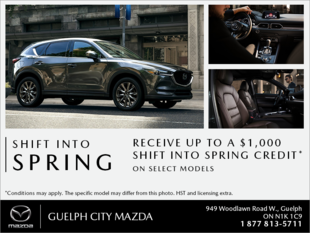 So, when it came time to look for another vehicle, my husband and I did not hesitate to consider Guelph City Mazda. We were introduced to Dominic, the used car manager, who listened to our needs and pointed us in the direction of either a new or used CX-5. For our family, the added features from the Mazda Certified Pre-Owned program (Great finance rates, extended warranties, and roadside assistance) made the used vehicle option a perfect fit for our family. When we came to pick up the vehicle, we were reintroduced to the sales manager, Mohsen, who showed genuine excitement for our family's new purchase. Our sincerest thank you for making such a stressful situation into a relaxed and enjoyable process.